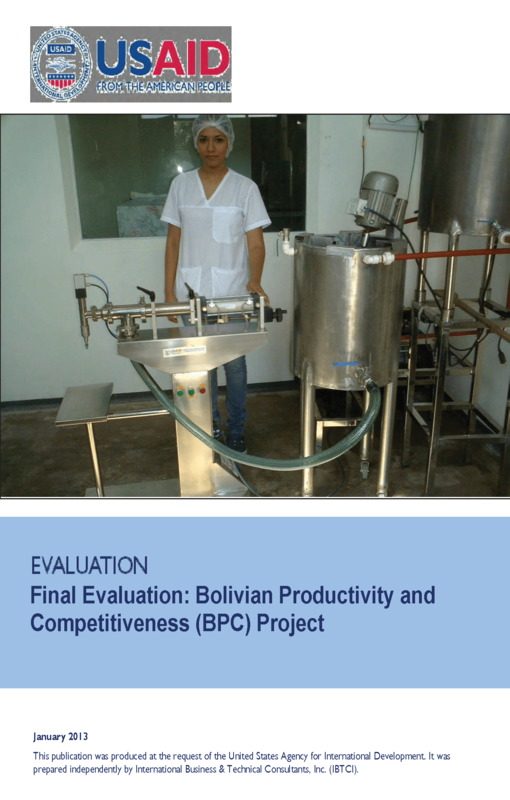 Luis Bernal, MPP, working as an expert on small business development as well as an evaluation specialist, carried out the final performance evaluation of the Bolivian Productivity and Competitiveness Project. Other members were: team leader Milton Núñez-Garcés, and local organizational development specialist Sergio Villaroel Böhr, all working for International Business & Technical Consultants, Inc (IBTCI) a Vienna VA based company that, in turn, was hired by USAID. The framework criteria applied by the evaluation, in accordance with USAID Monitoring and Evaluation directives, looked into the following project performance parameters: (1) Relevance, (2) Effectiveness, and (3) Sustainability. The evaluation included a review of each of the project objectives: (1) Improve the competitiveness and productivity of selected value chains (2) Strengthen local institutions that support the development of MSMEs -Micro, Small, and Medium Enterprises-; (3) Promote dialogue between key stakeholders to improve the business environment and competitiveness of value chains and MSMEs; and, (4) Leverage funding from the private sector, other donors and public institutions using a Global Development Alliance (GDA) funds and other sources of funds. A country-wide project, BPC worked in the cities of La Paz, Cochabamba, Santa Cruz de la Sierra, Tarija and Chuquisaca, focused in the following sectors: Textile and Apparel, Wood Manufacturing, Processed Foods, Bio-products and Handicrafts. BPC provided assistance to artisans, micro enterprises, small and medium businesses, as well as trade associations with services such as technical assistance, trade support, workforce development, business round tables, and manufacturing systems improvement. Funded by USAID in 2009, The BPC project was executed by Chemonics International, Inc. with a total estimated budget of US $ 9,771,913; for a period of four years. However, due geopolitical conditions related to the relations between the U.S. and the Bolivian governments, the project was reduced in time (only 3-1/2 years) and budget reductions of approximately 18%. Overall USAID programs dealing with MSME promotion had an early close-out; in the case of the BPC it ended it in January or February 2013.